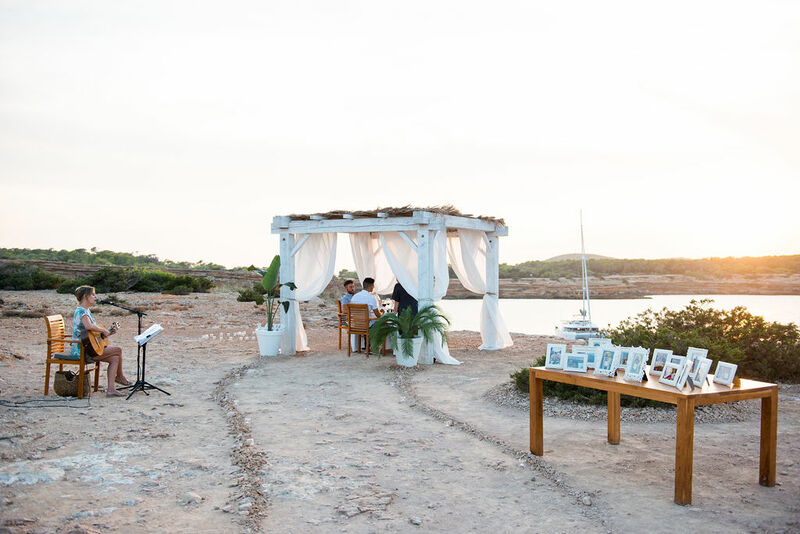 Here at Cardamom Events Ibiza, we fully appreciate how unique and heavenly touches can enhance your special occasion. 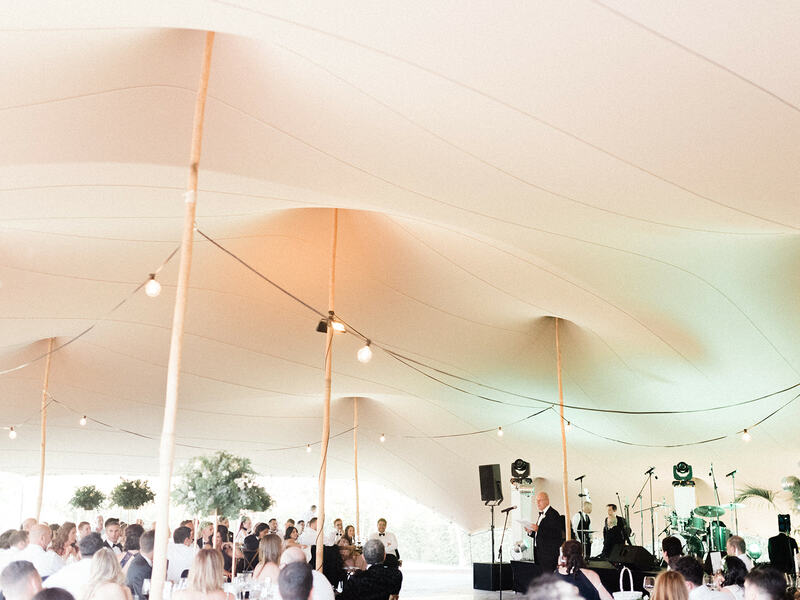 With this is mind, we are huge fans of Suzanne Sutherland – opera singer extraordinaire. 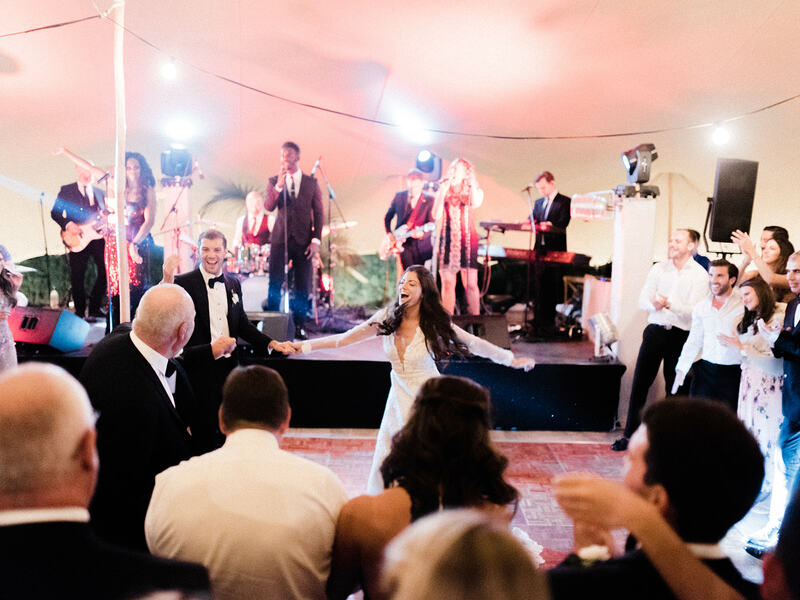 Suzanne is a classically trained singer who specialises in opera and oratorio. 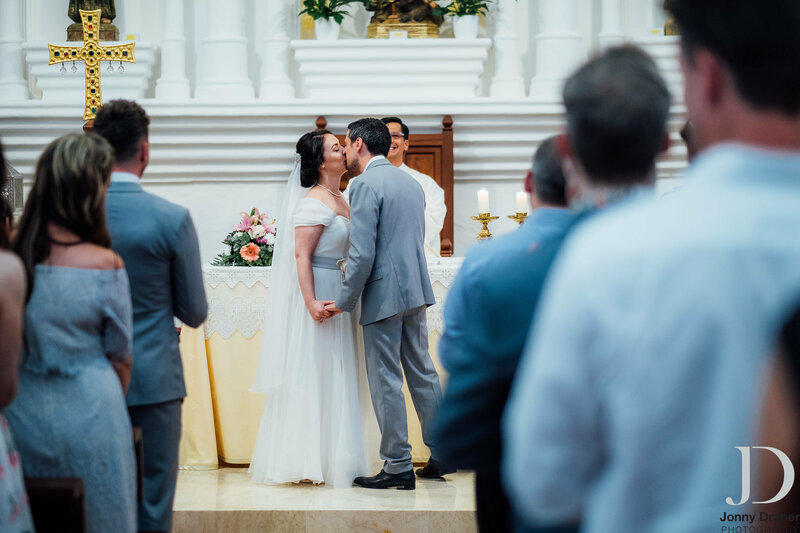 After completing a music degree, she trained in London with some exceptional operatic specialists, her last vocal coach being Kate Warsaw at the English National Opera. 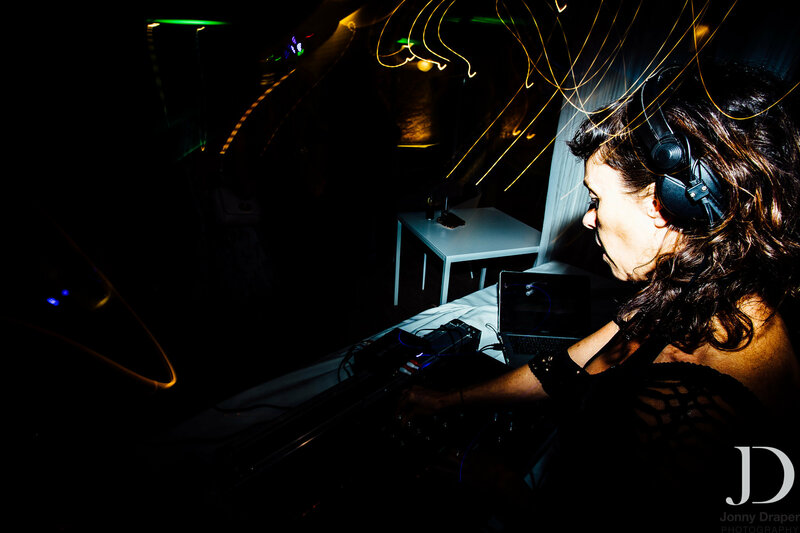 She has performed repertoire in both opera and oratorio over the years for numerous weddings, corporate events, church services and private events and has recently moved to Ibiza with her family to offer her truly unique talents to the island. 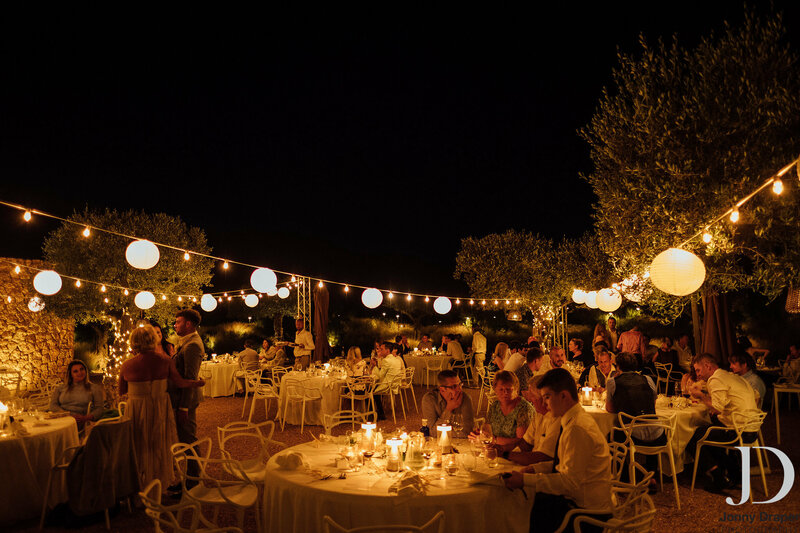 With 20 years performance experience Suzanne provides a high quality service to both her wedding and event clients. 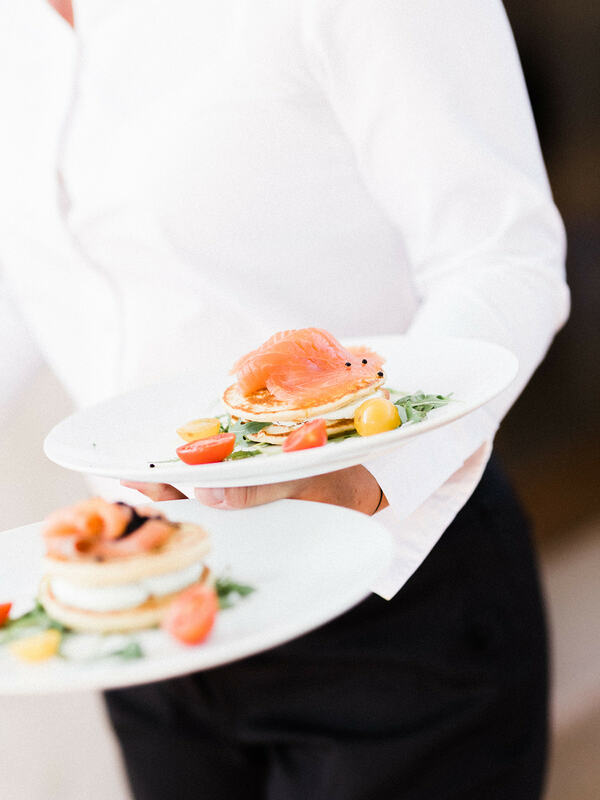 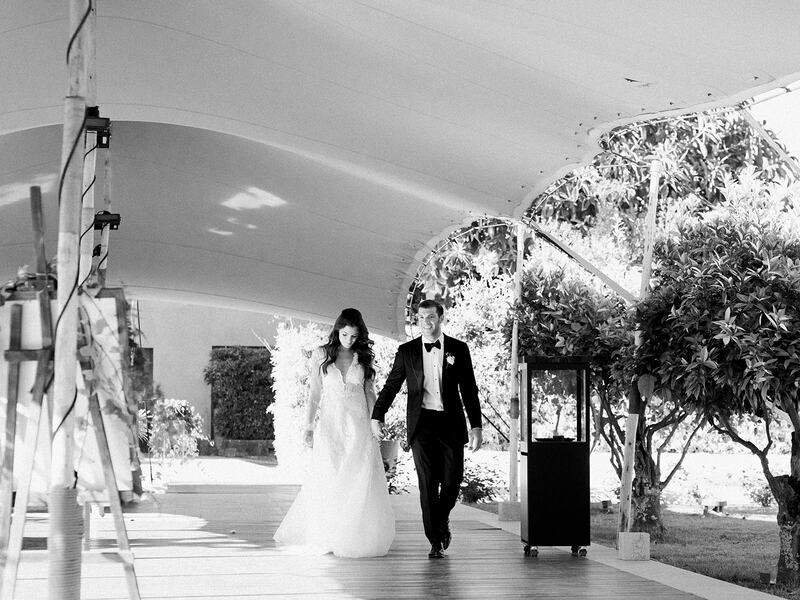 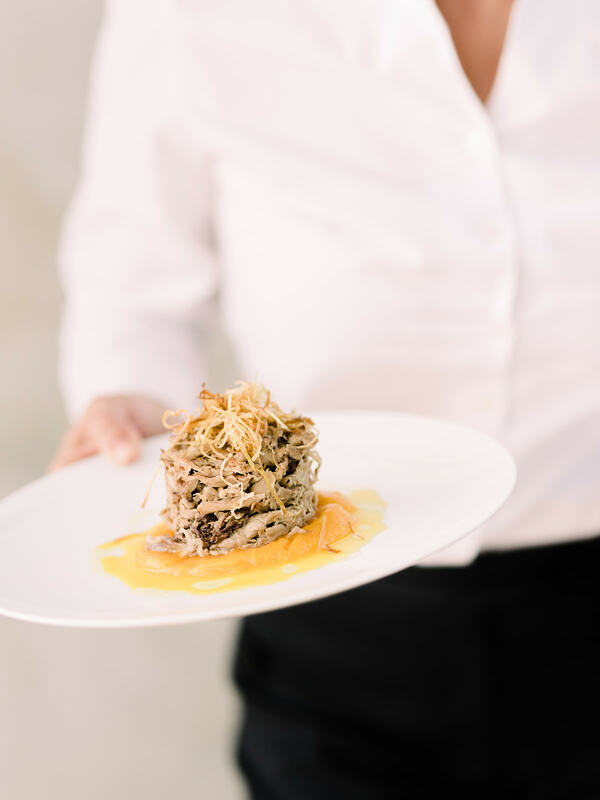 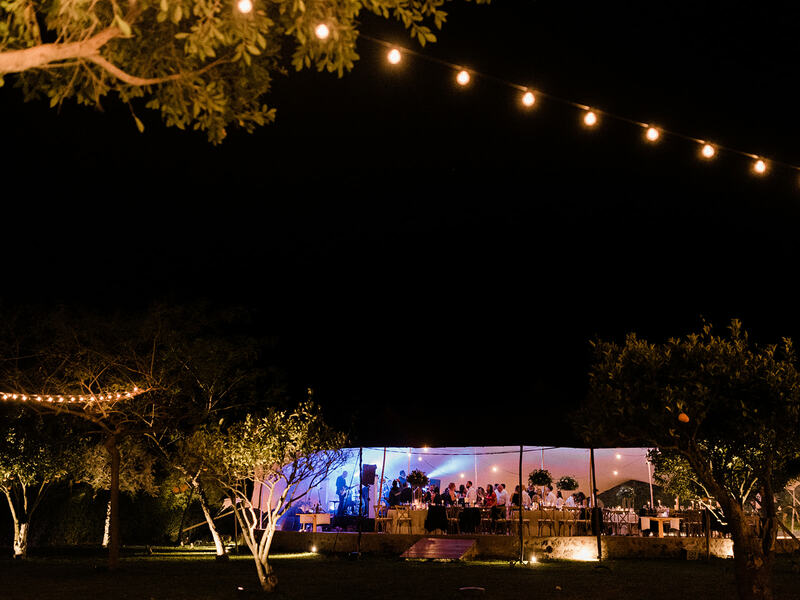 When it comes to weddings and events, Suzanne offers an exceptional experience for both client and guest. 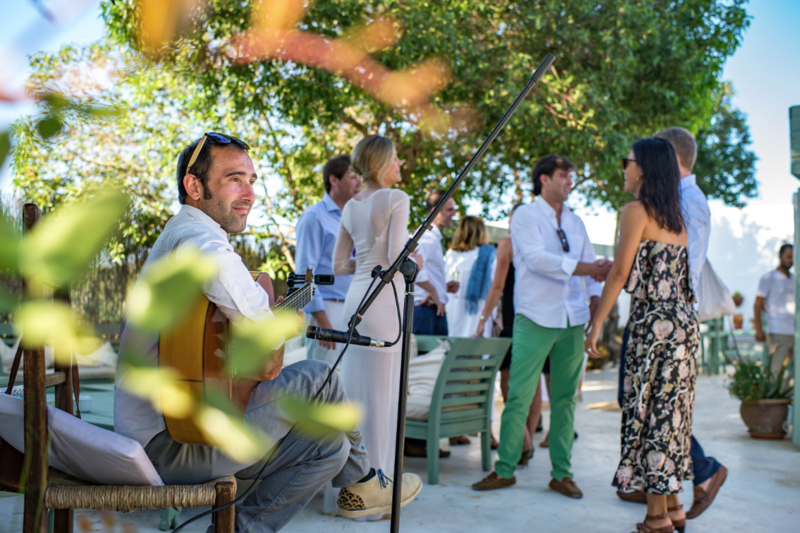 Her Operatic/classical repertoire has been known to reduce grown men to tears! 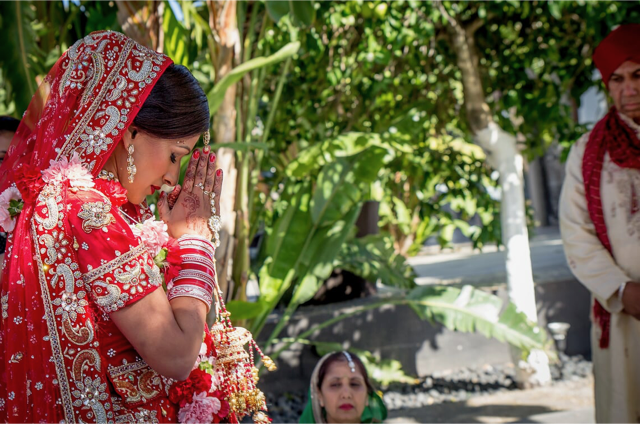 Beautiful, ethereal and professional, we cannot recommend her enough. 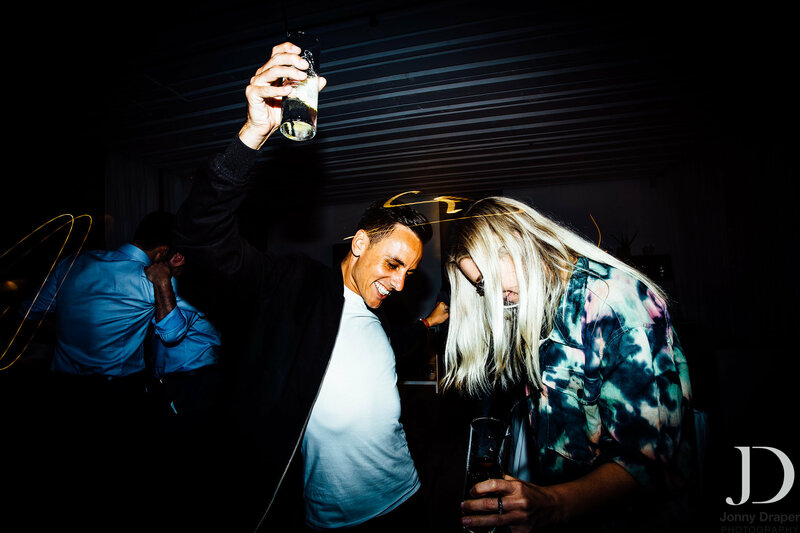 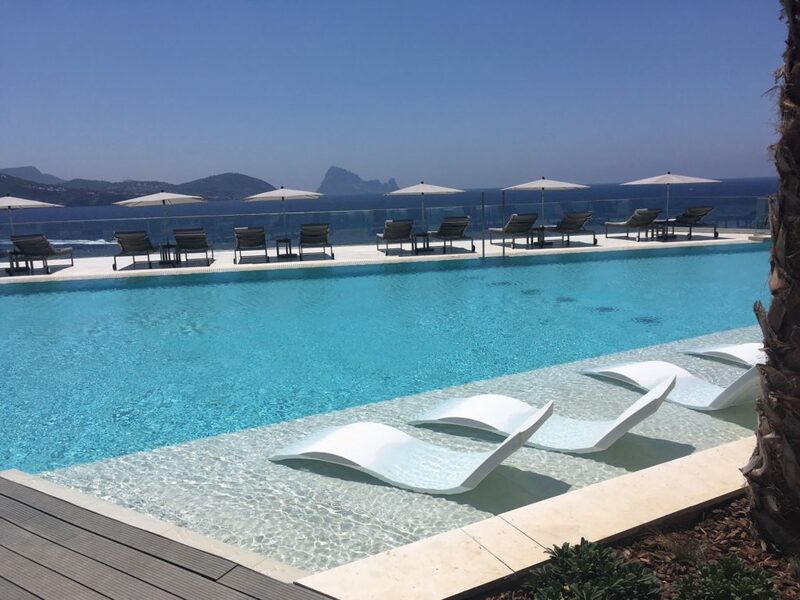 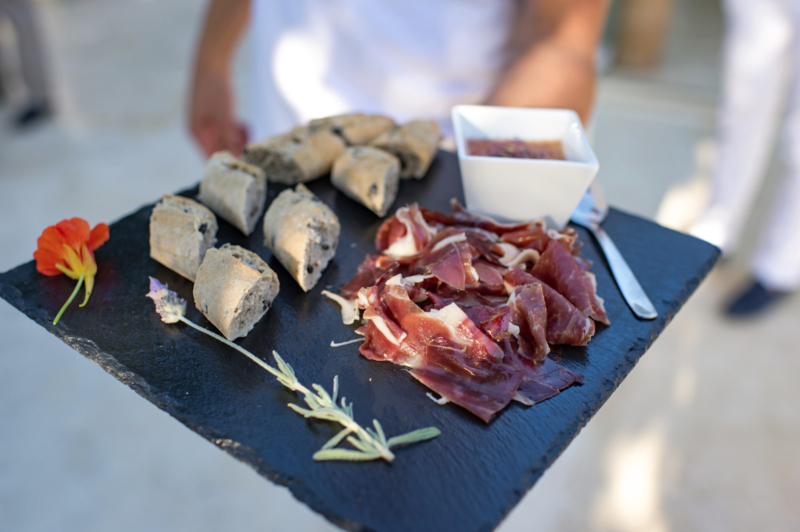 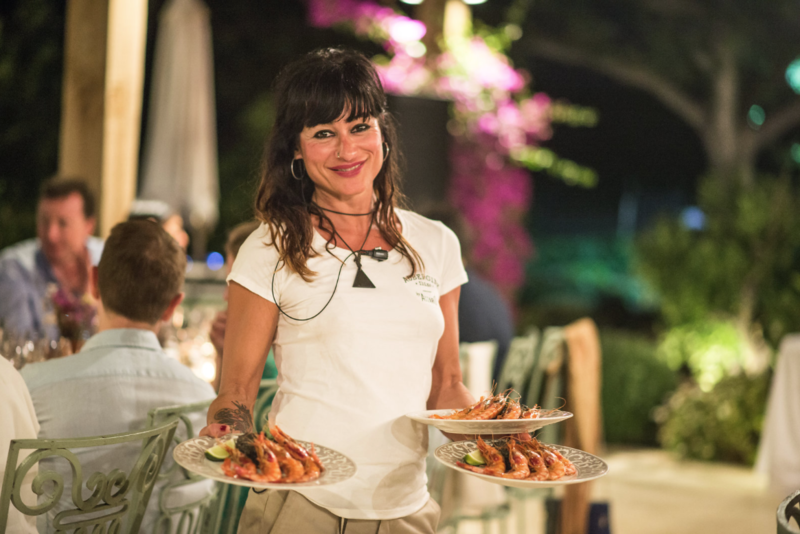 Charming The Influencers – Ibiza Style! 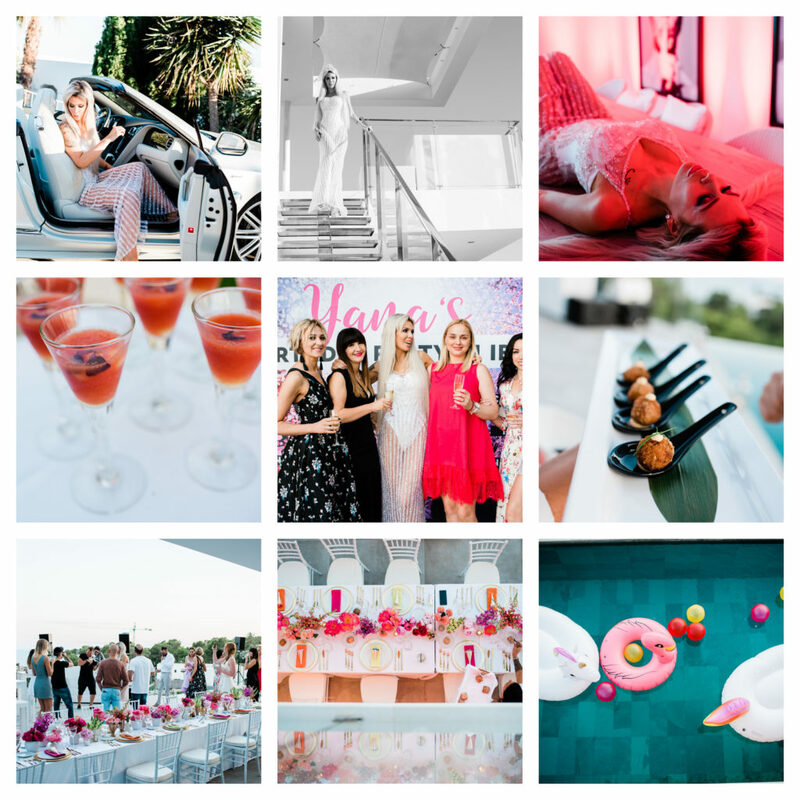 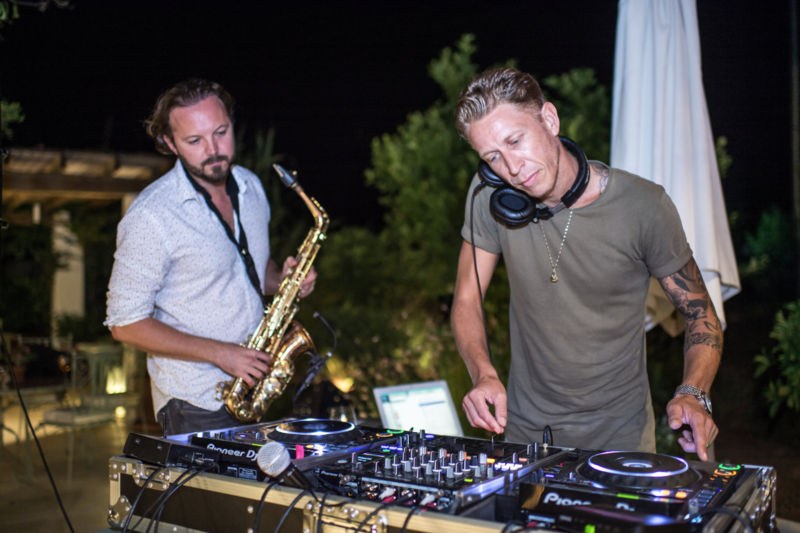 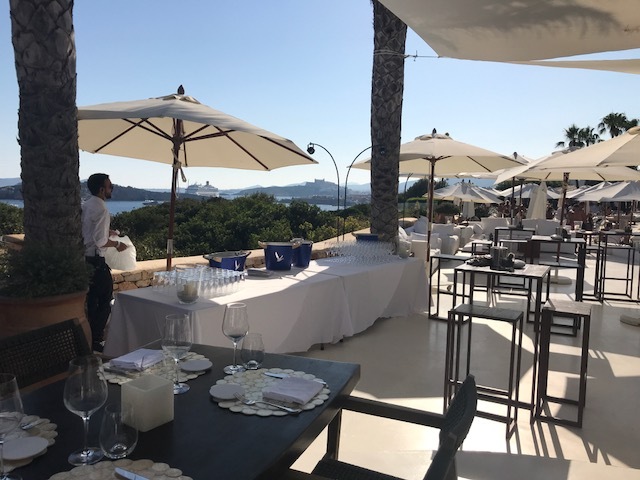 Earlier this year, Cardamom Events Ibiza were tasked with creating and delivering a unique and glamorous corporate event for communications giants Huawei. 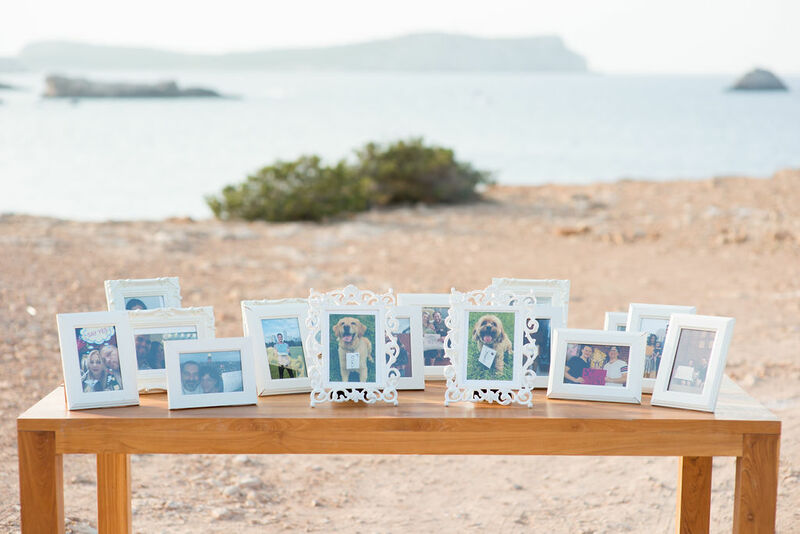 We accommodated all the guests at the stunning new 7 Pines Resort where we also set up a photo and embellishment workshop. 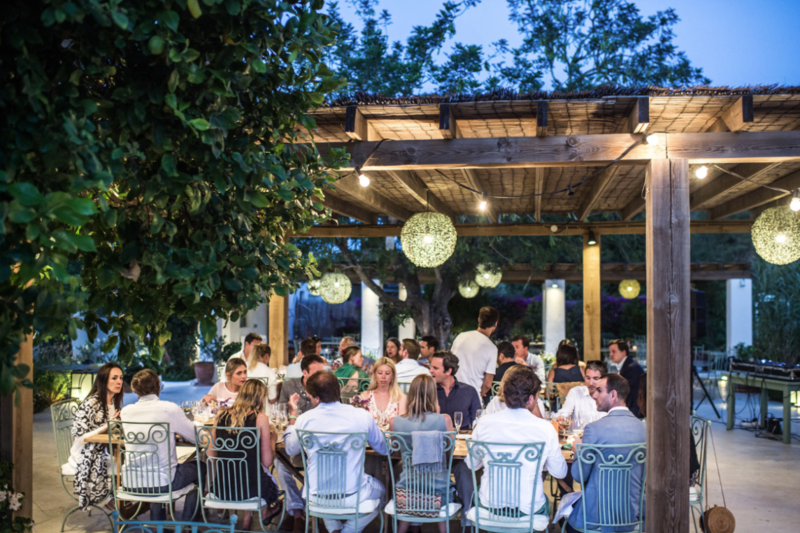 The group was then transported for a breathtaking dinner at one of Ibiza’s finest sunset spots Hostal la Torre. 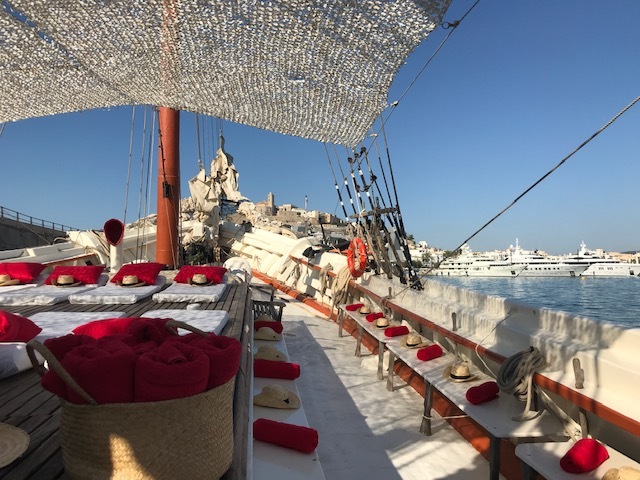 The next day, an elegant sail boat took them on a trip to neighbouring Fomentera before they dined and danced beneath the stars at Destino. 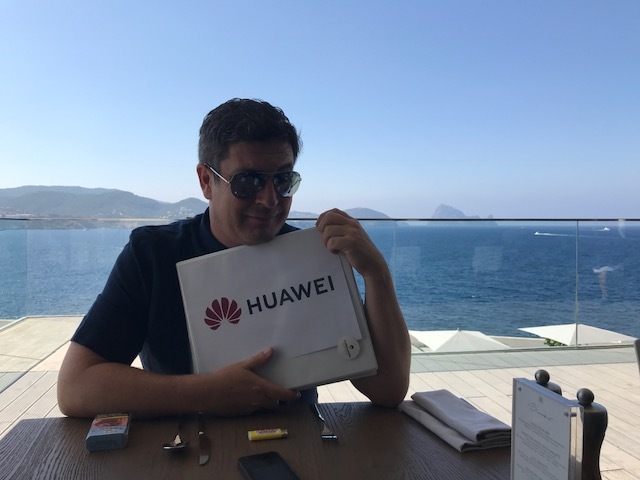 It certainly was a corporate event unlike any other, and one that Huawei’s clients will NEVER forget! 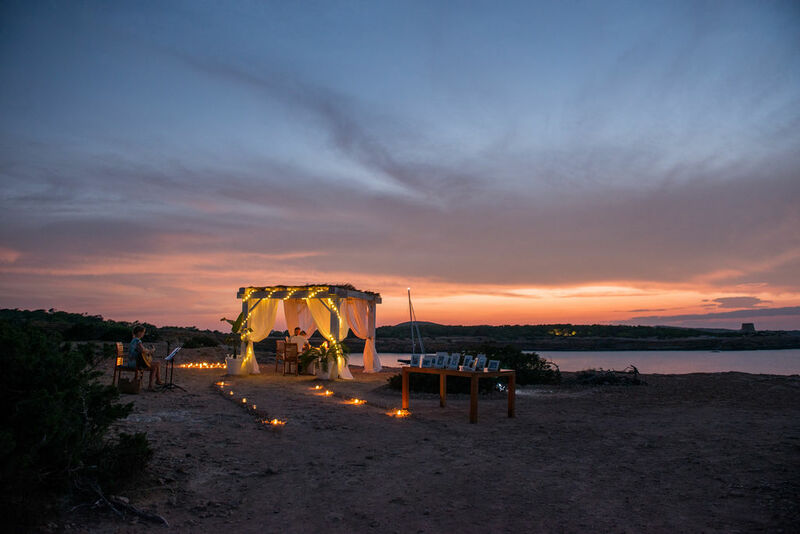 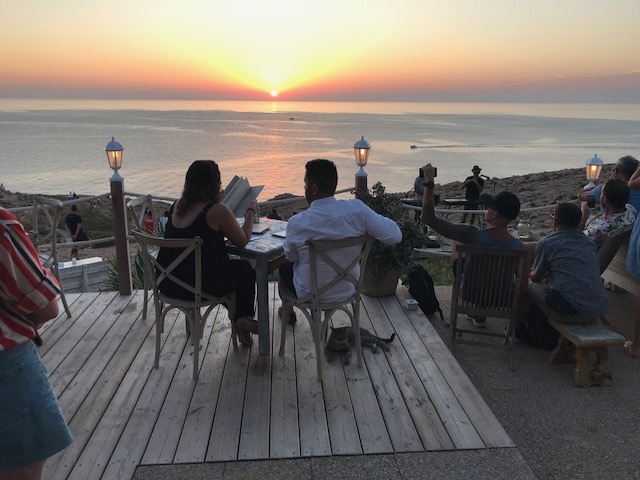 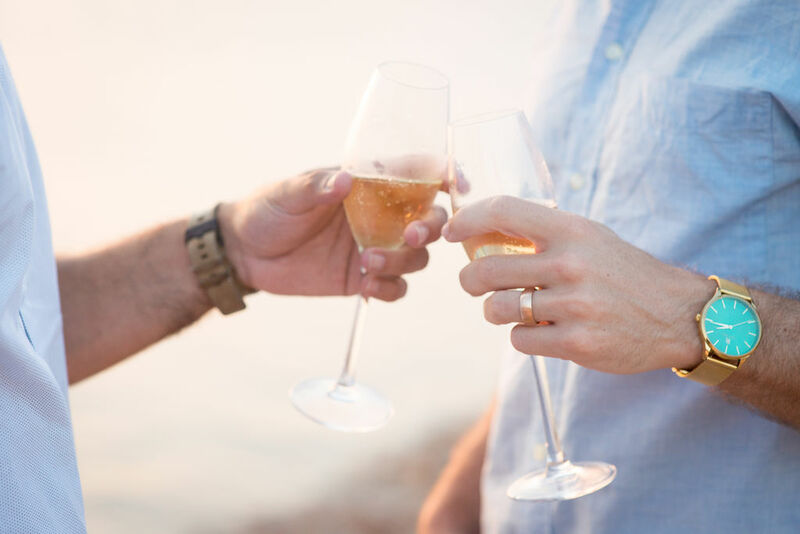 Then as the sun sets, your partner gets down on one knee and presents you with a custom made ring, as a beautiful guitar player serenades you before you sit down to a private romantic dinner under a cliff-side pagoda. 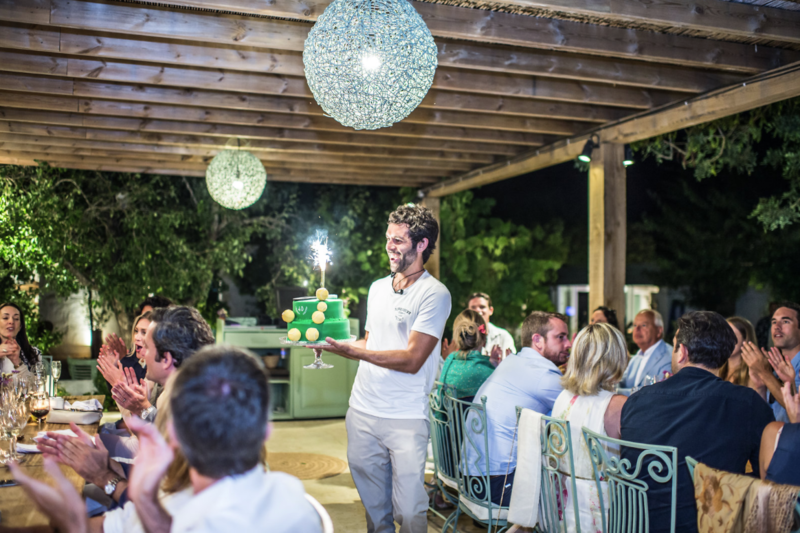 In Acciaroli in Italy, more than one in 10 residents live longer than their hundredth birthdays. 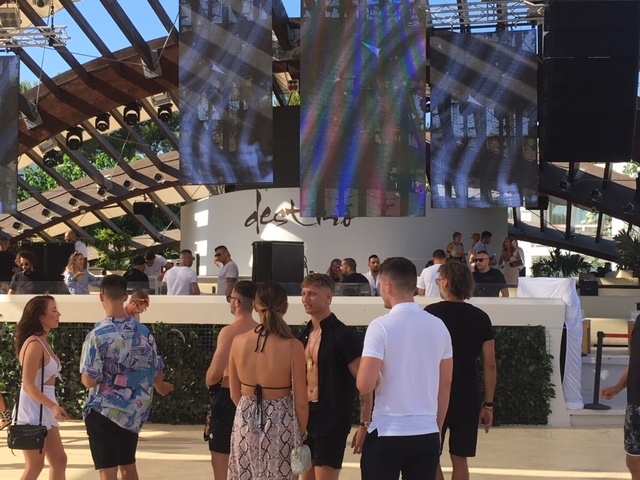 They do so while enjoying a lifestyle that many would consider unhealthy: they drink, they smoke, and they indulge their every pleasure. 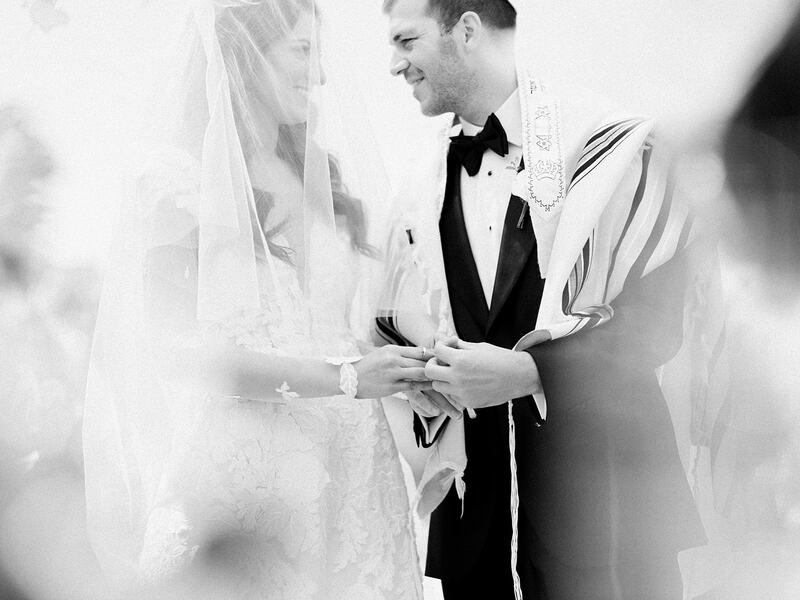 So, what’s their secret? 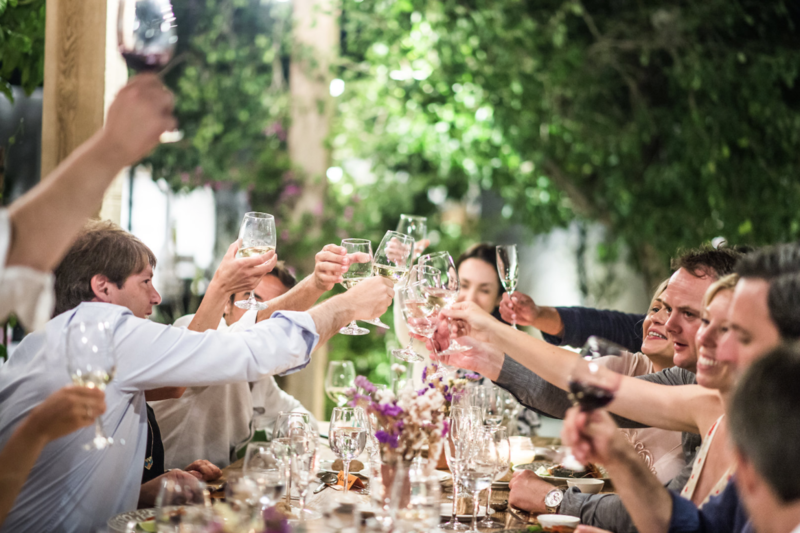 According to several scientists, the key variable may be fresh rosemary – a ‘super’ herb with a number of longevity and health boosting properties. 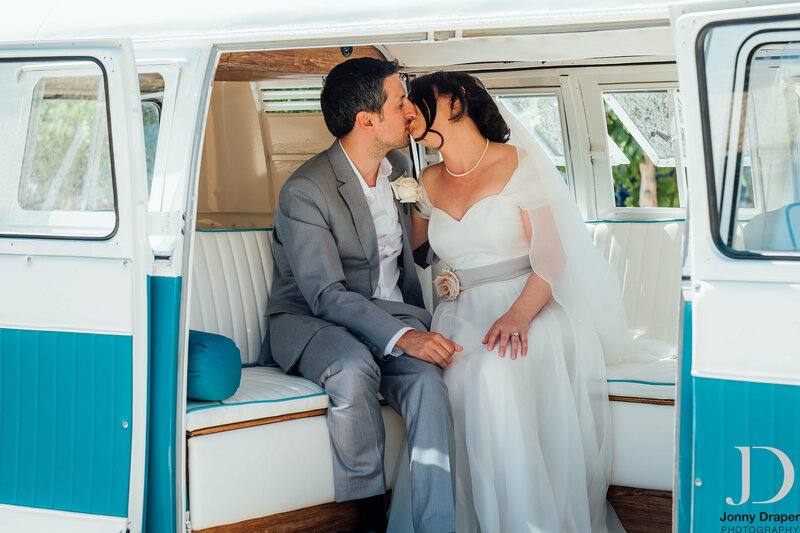 The town’s story fascinated David Spencer-Percival – an experienced former CEO of two multimillion pound recruitment companies – and his wife Bonita. 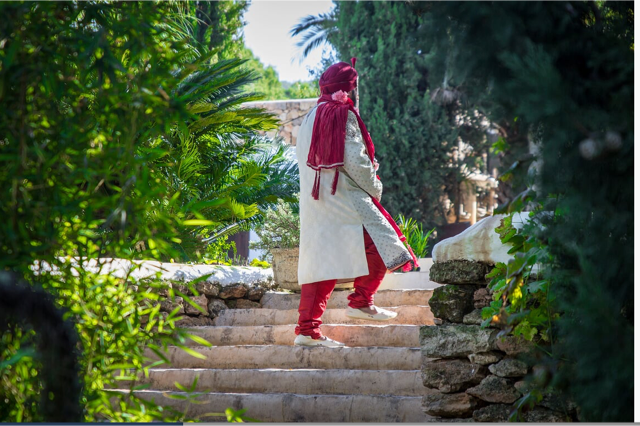 So much so, in fact, that they visited the town together and saw this lively, vibrant community of healthy centenarians for themselves. 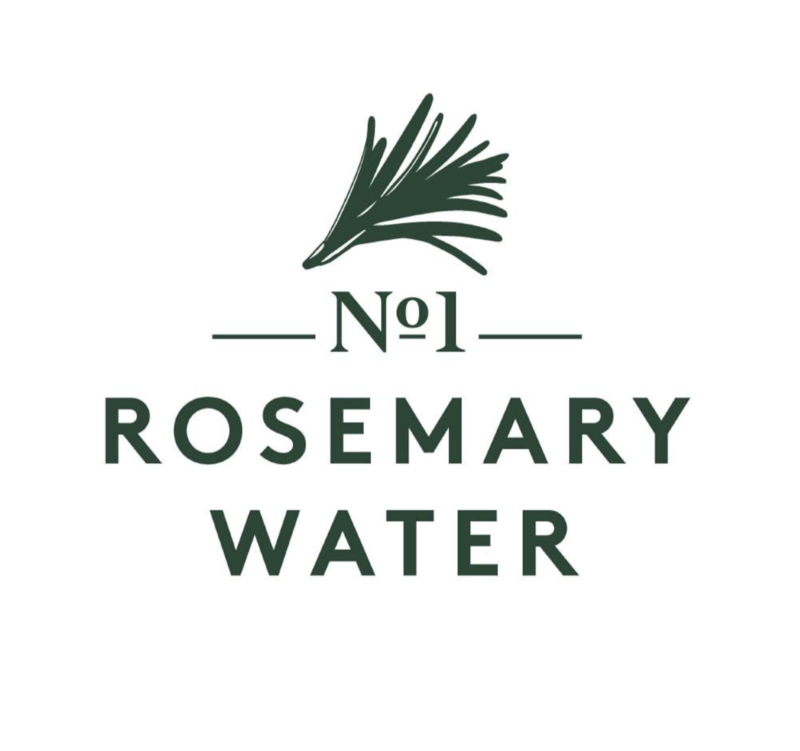 Inspired by the town and its fun-loving, long-living residents, they launched No1 Rosemary Water – the world’s first pure rosemary extract drink. 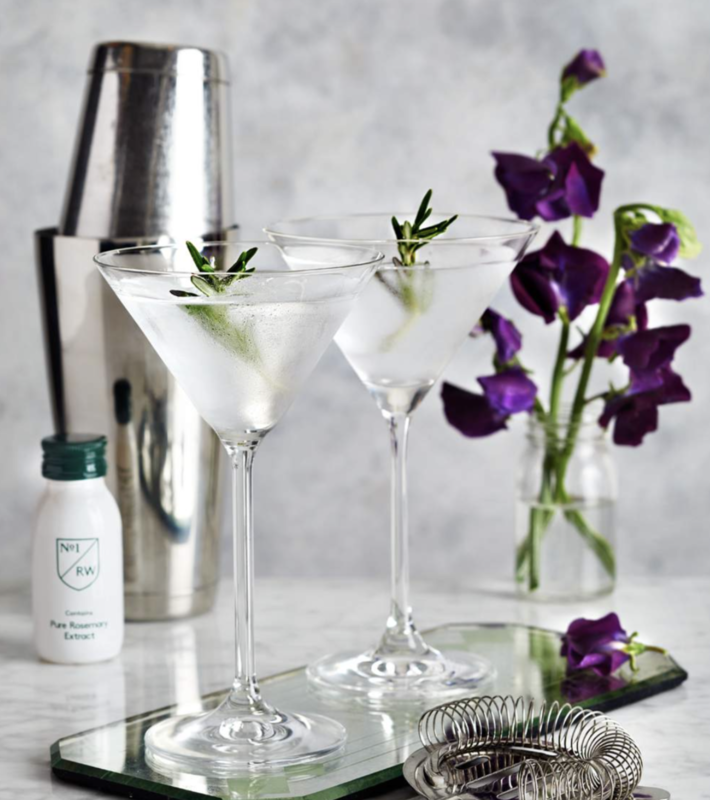 Cardamom Events are thrilled to be able to offer No.1 Rosemary Water for any of their events, whether it be in welcome cocktails designed especially for the occasion, bottles as a refreshing alternative to soft drinks, or shot bottles with breakfast the following day. 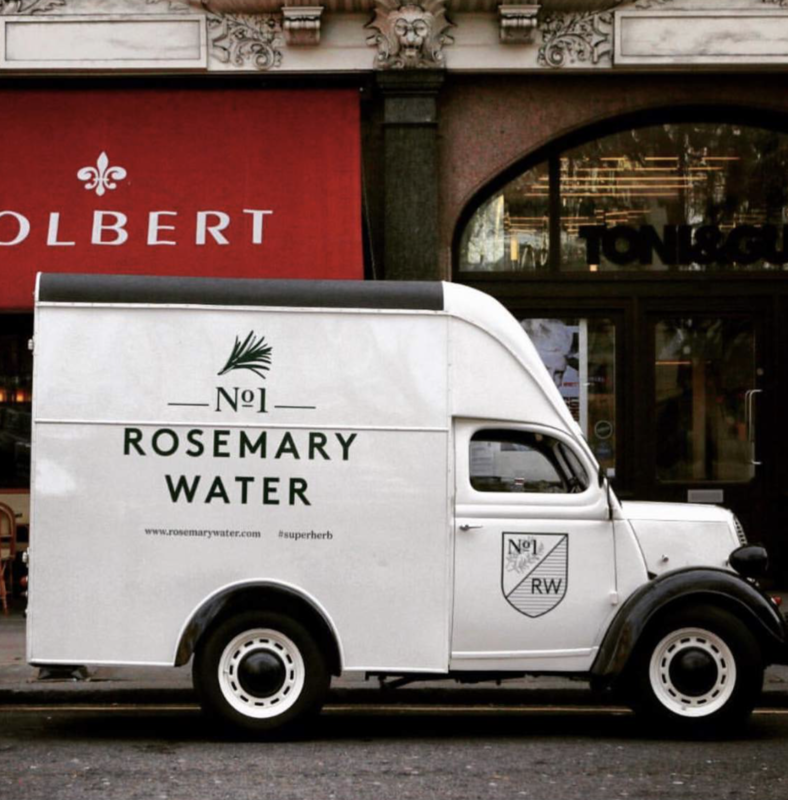 From personalized bottle tags, to having the branded van on display for pop-ups, both ourselves and the No1 RW team just love to get creative! 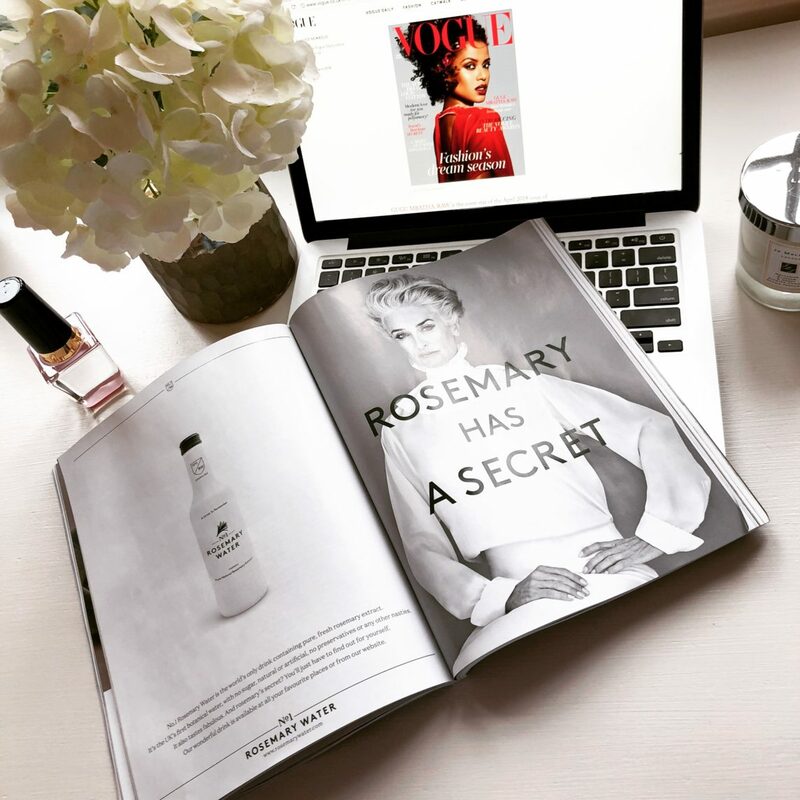 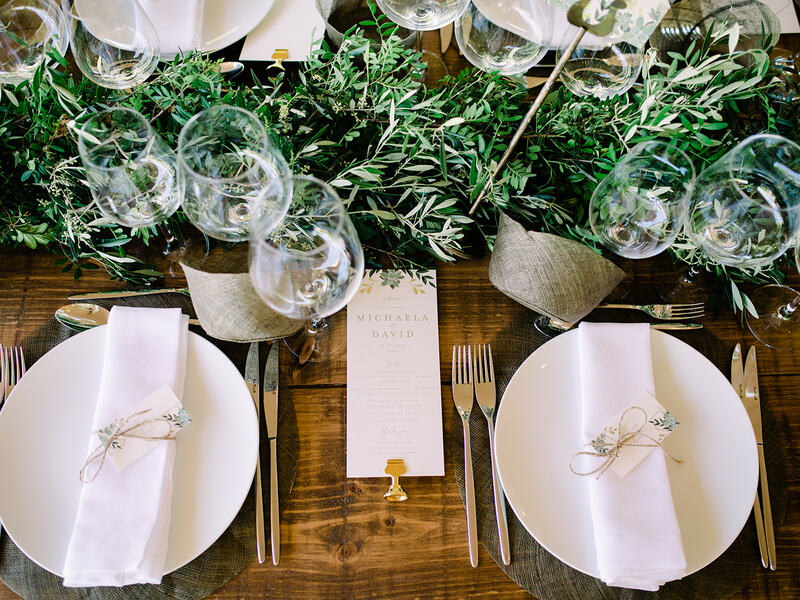 Why not stay ahead of the crowd with Cardamom Events and No.1 Rosemary Water?! 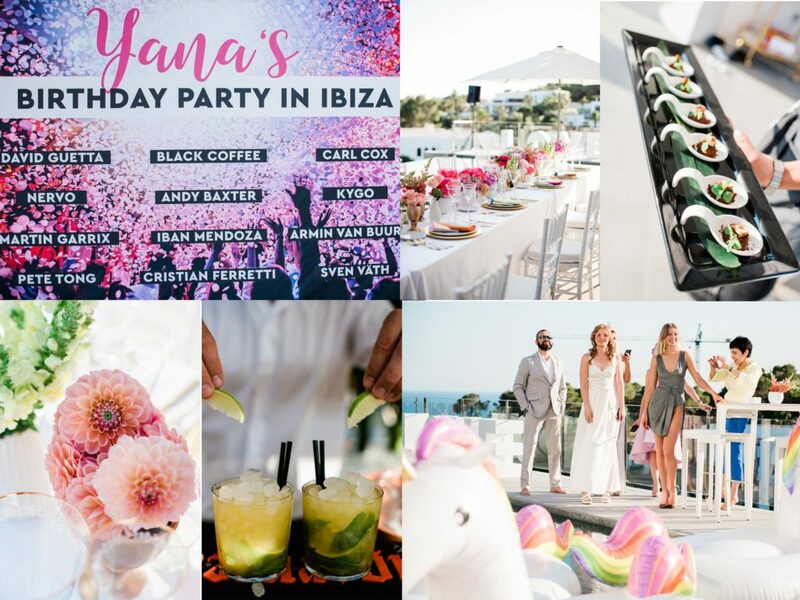 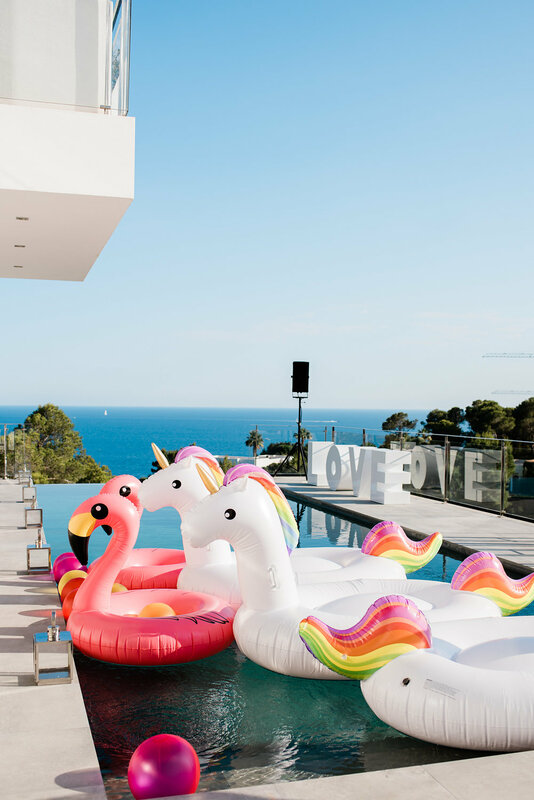 Earlier this summer, Cardamom Events Ibiza were asked to create, design and deliver the most grand of birthday celebrations for some extremely glamorous clients. 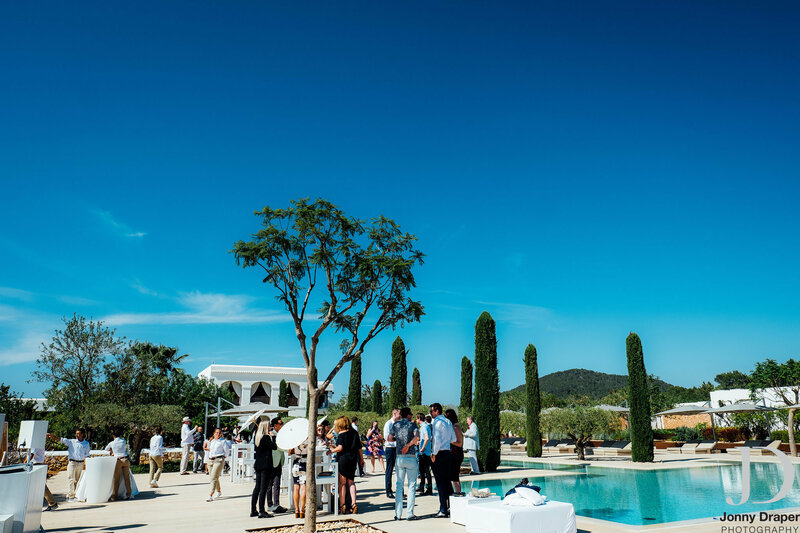 The brief for the party, held at the spectacular Villa Glory, was that it had to be colourful, and it had to incorporate the best DJs we could find! 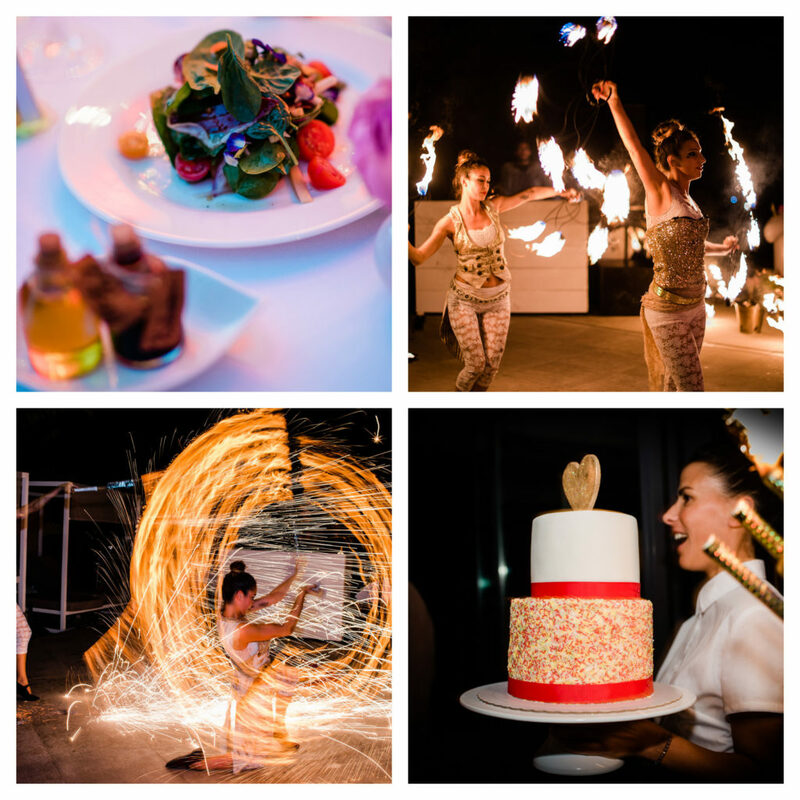 Canapes were delivered whilst the intimate number of just 15 guests were entertained by dancers in an oversized champagne glass from Krystal Shows. 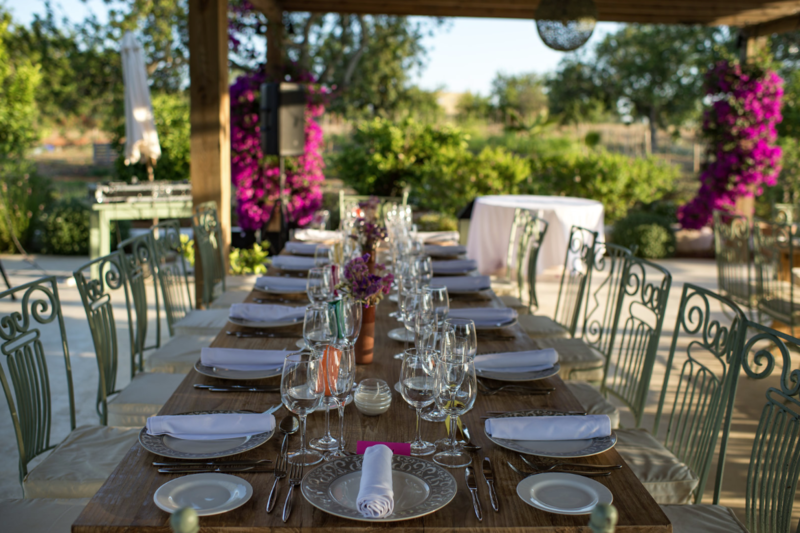 A beautiful alfresco formal dinner was prepared by The Chef Ibiza with flowers from Ramo De Flores. 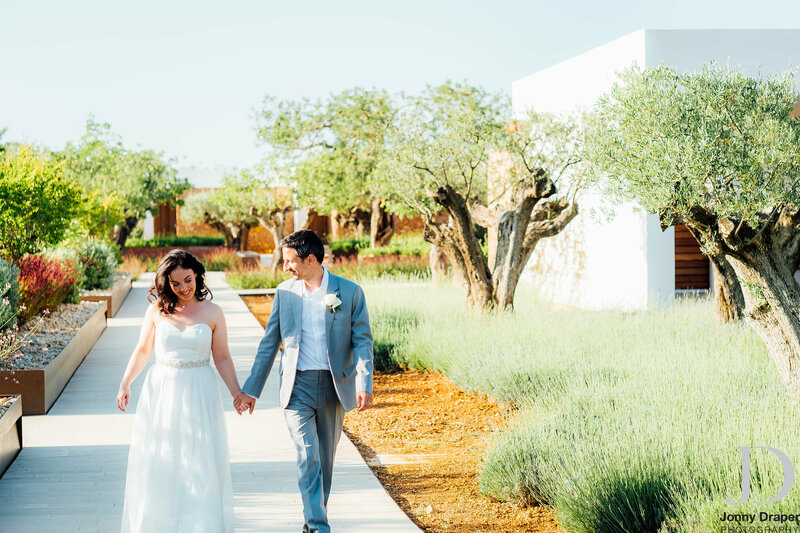 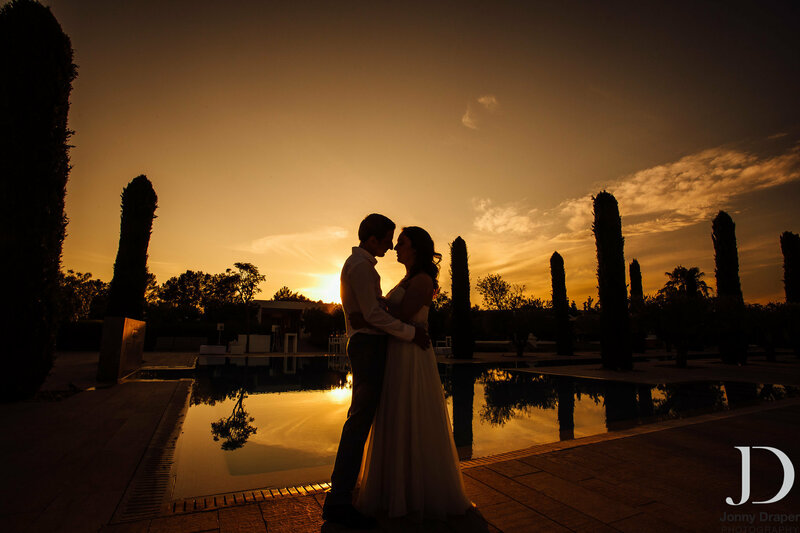 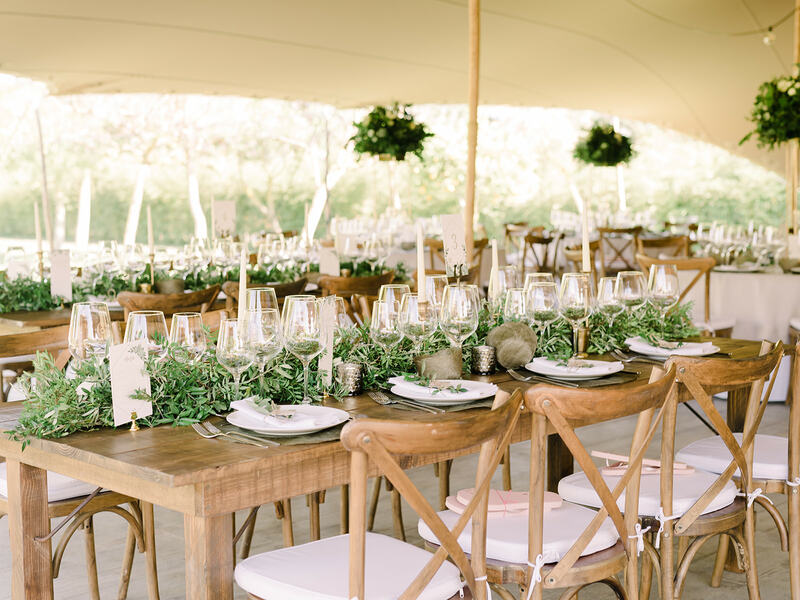 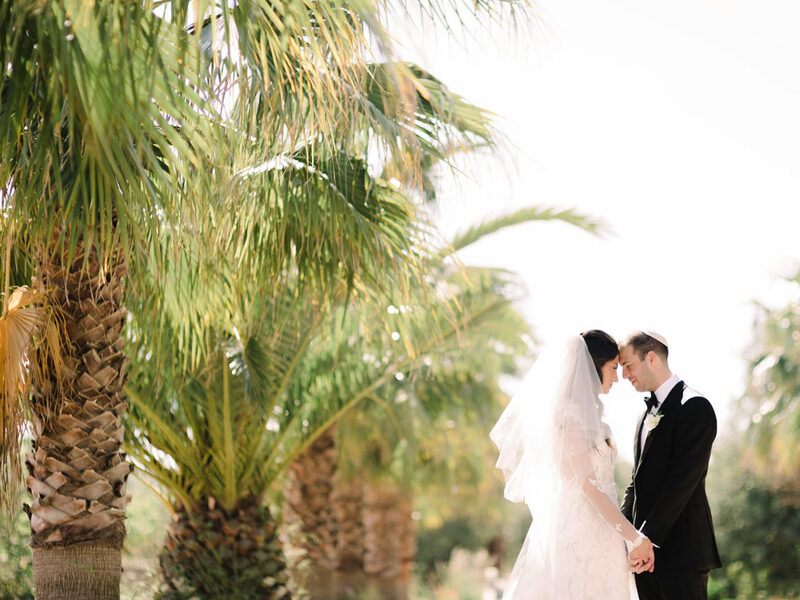 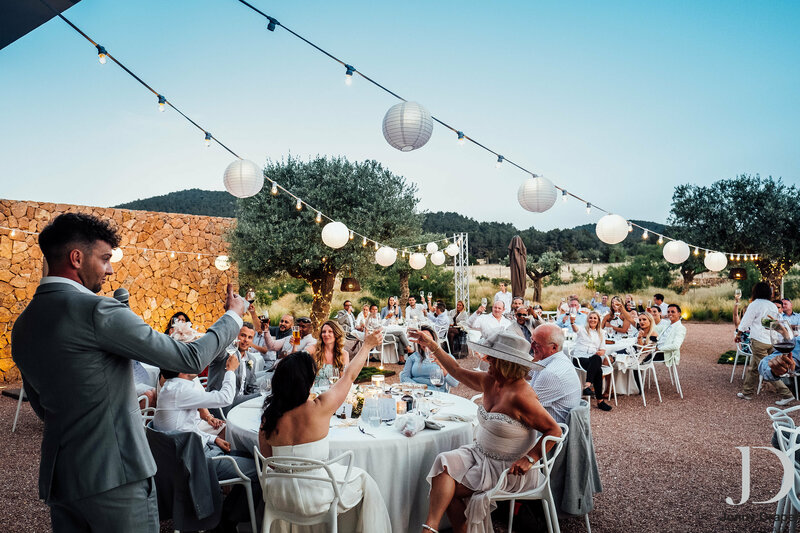 Back in May, Cardamom Events Ibiza had the pleasure of working together with Michaela and David to design, create and deliver the most magical of Ibiza Jewish weddings. 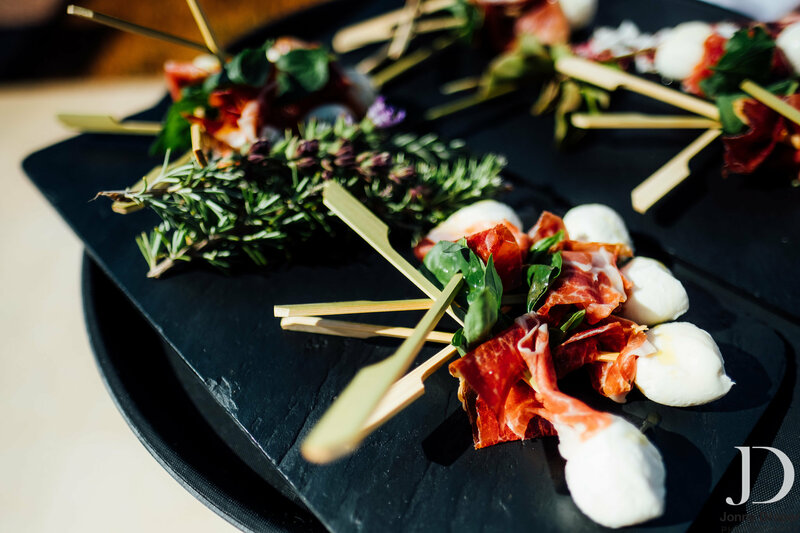 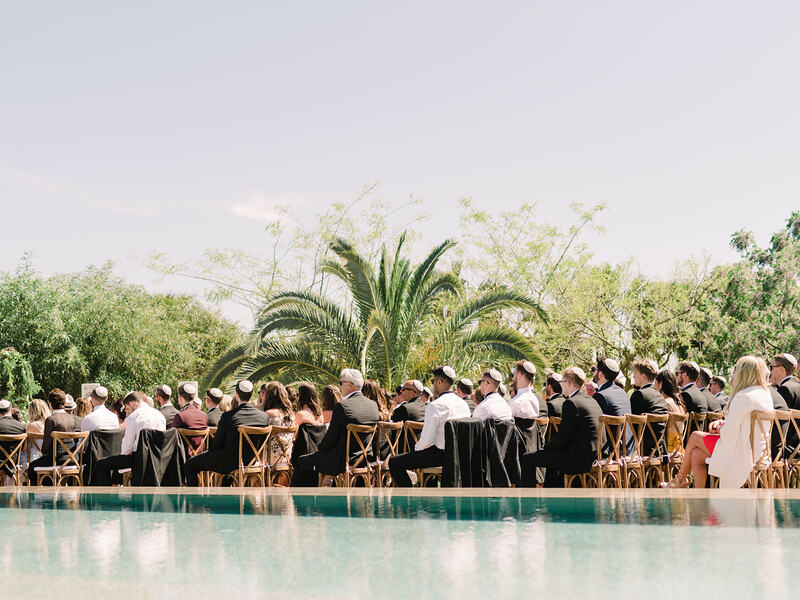 A black tie affair, the focus was on the big family that arrived en masse to help the beautiful couple celebrate… The ceremony, dinner and party were held at the stunning Hotel Xereca in Puig d’en Vals, on the outskirts of Ibiza Town. 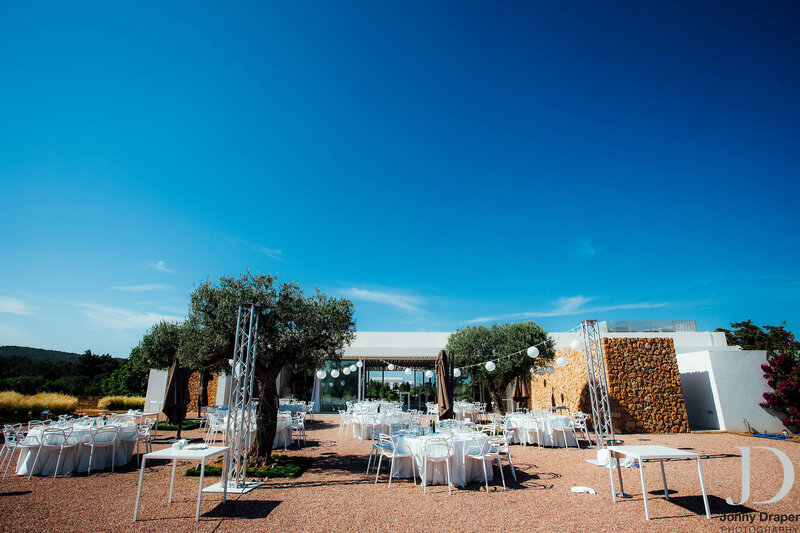 Starting off in the afternoon, guests were welcomed and seated for the ceremony in the warm early summer sun. 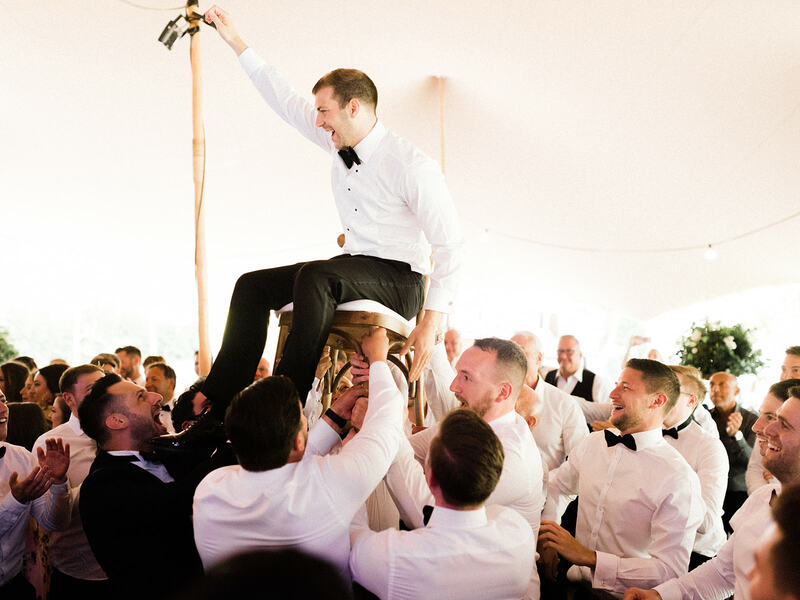 After the ceremony, the wedding party was seated under a purpose-built marquee and treated to a live PA by London band Sway and a delicious 3 course silver service dinner. 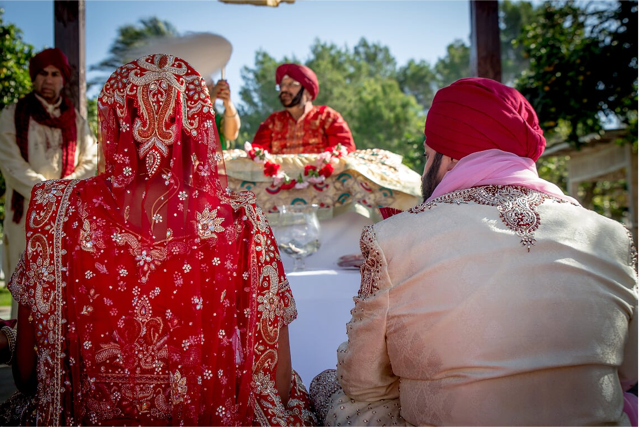 Cardamom Events founder and director Navine Colligan was recently asked to create, design and execute the perfect Sikh wedding for her niece. 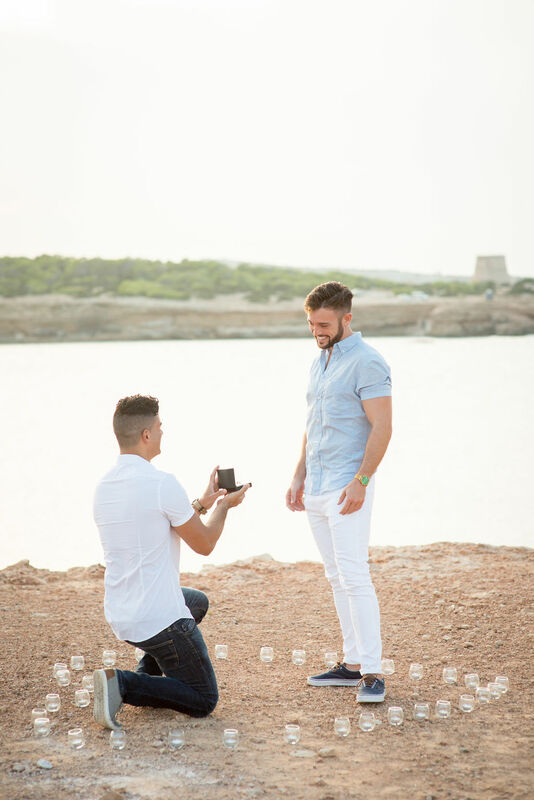 The only catch being it had to be here in Ibiza! 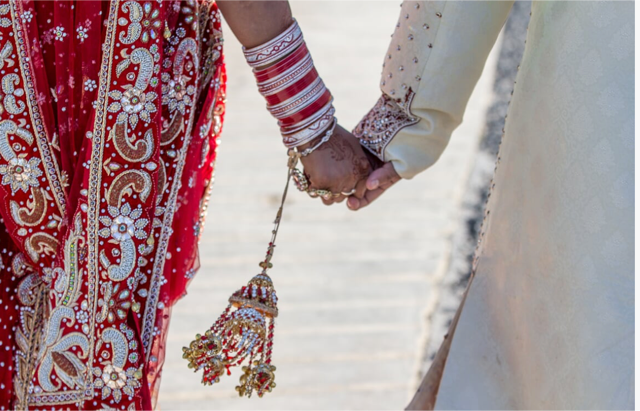 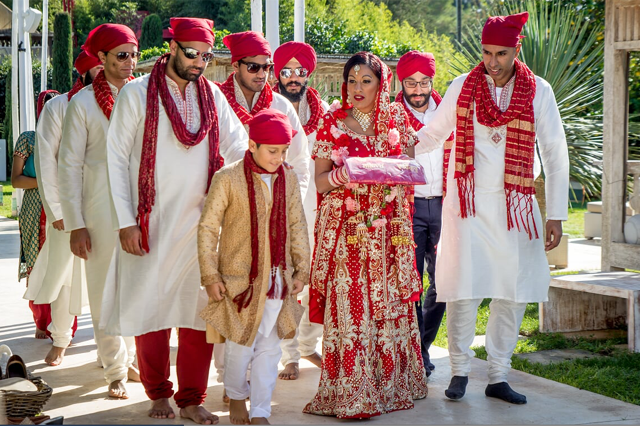 Navine said “It’s very hard and a lot of pressure organising Indian weddings in the UK and India now as Indians normally have a guest list of 500 people on average. 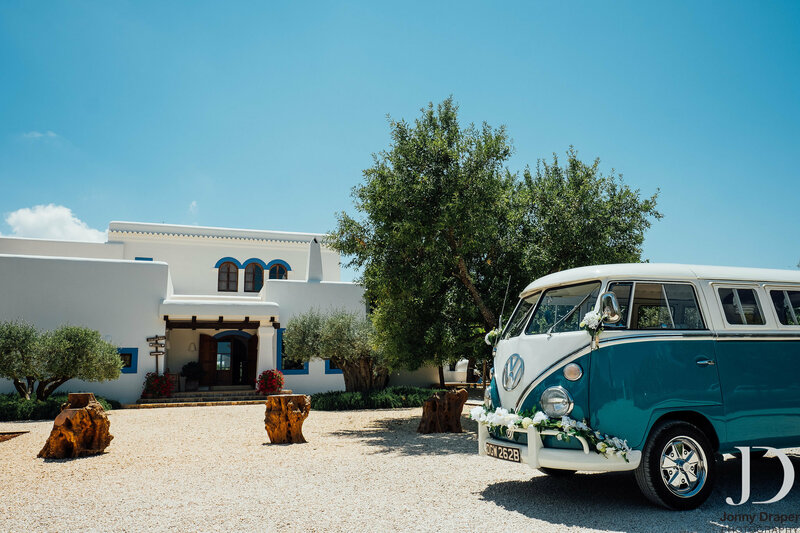 So destination weddings have become extremely popular and Ibiza is an amazing backdrop for these amazing colourful events. 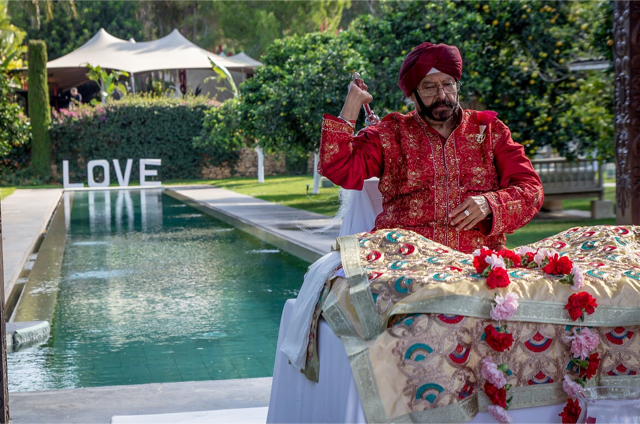 The venue was a must as Reena (Navine’s niece) had always been to Ibiza over the years and fell in love with her great times there so Atzaro was the chosen venue. 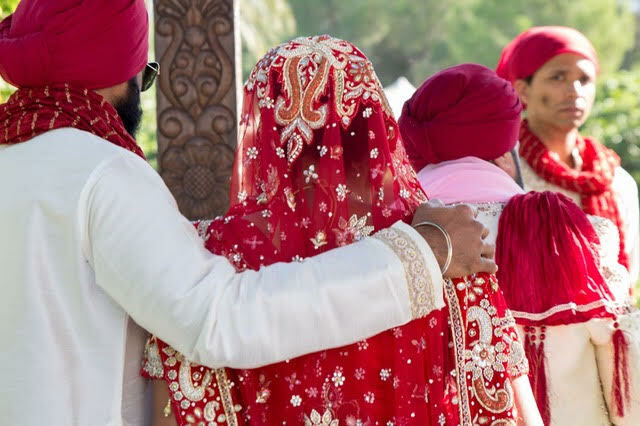 From a Ladies Sangeet, to a Mehndi party night and a Sikh matrimonial ceremony, non stop Bhangra beats and folk dancing from early morning till early hours – this 3 day event was mind-blowing! 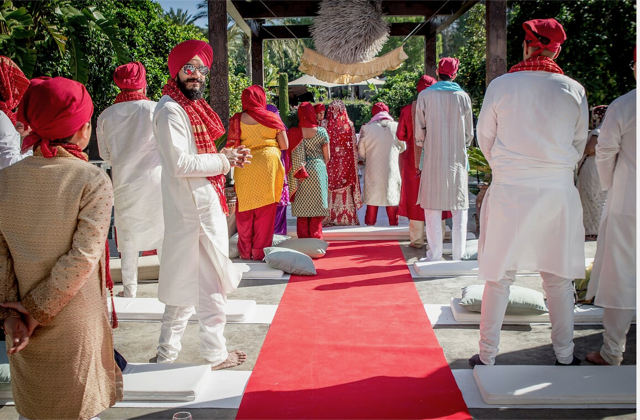 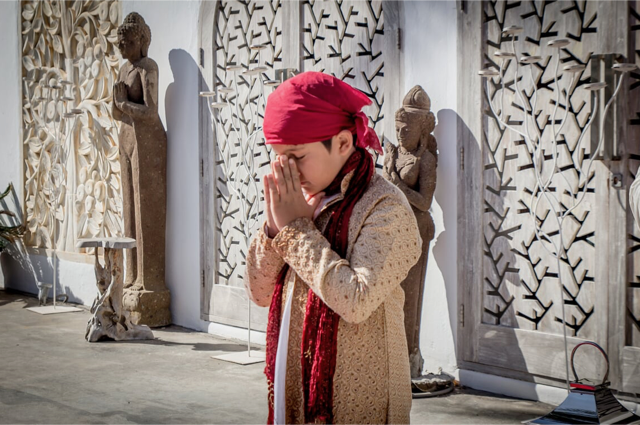 Sikh ceremonies are near impossible to do outside a temple, so this was a real test of Cardamom’s capabilities! 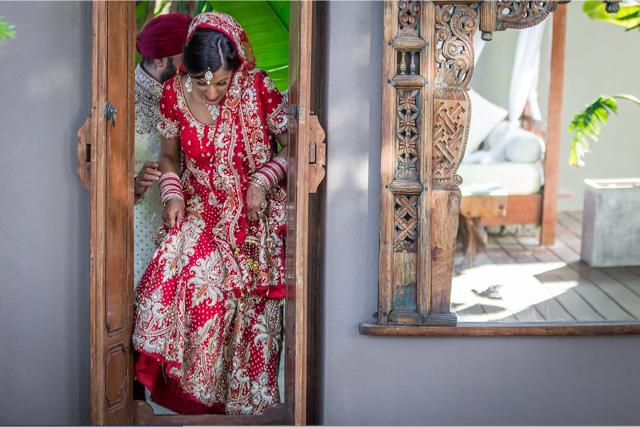 But of course, Craig and Navine love a challenge and with this whole event being so important to them, they felt that it demonstrated some real strengths of how they can achieve the unique and traditional! 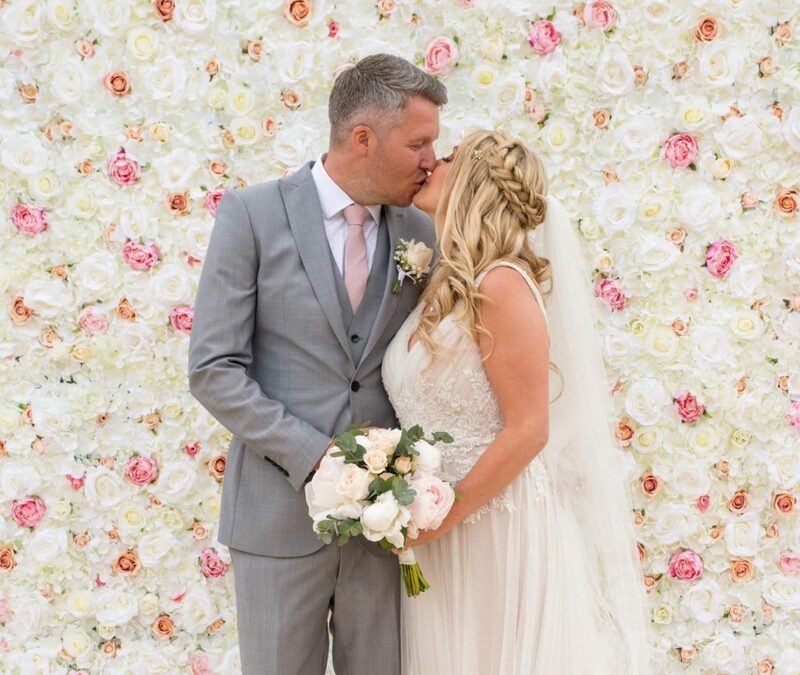 It’s All About The Floral Photo Calls! 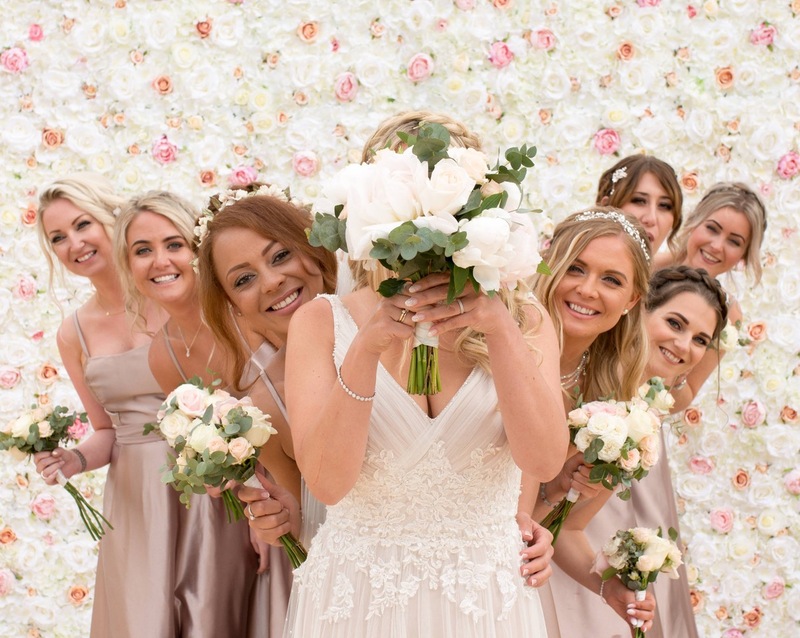 Floral photo calls with silk flowers are all the rage. 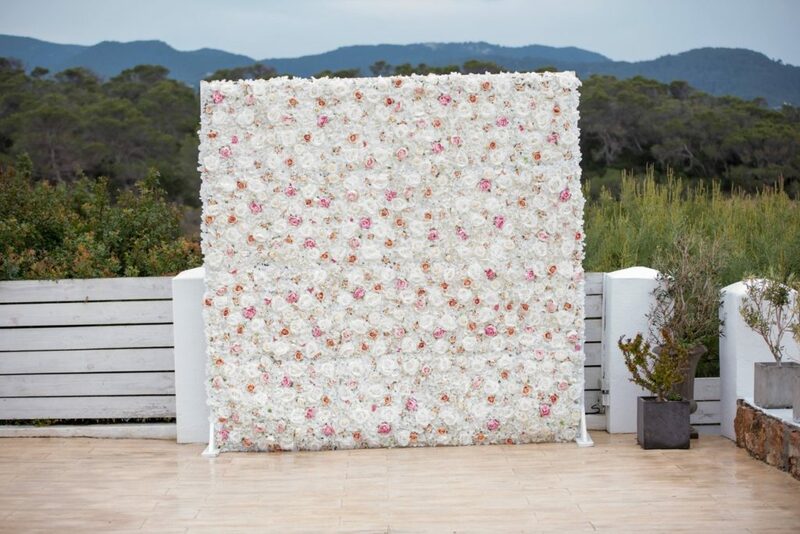 The walls are made with love, with high quality silk flowers combining complementary colours to create stunning one off designs. 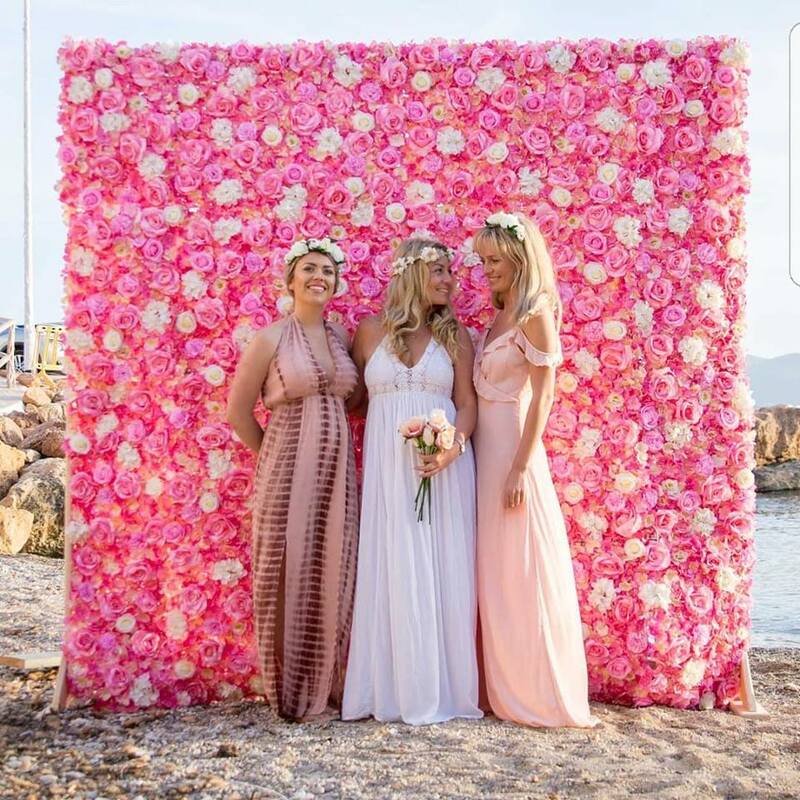 There are currently three adaptable walls available to hire, Timeless, Rose and Pretty in Pink, with a foliage wall under construction.